Tondrae began singing in church at the age of 10 in his native Baton Rouge. As a teen, inspired by hip-hop pioneers Rakim, Public Enemy and Main Source, he took to the stage as a rapper. However, during his adventures in hip-hop he had a revelation, in his words “every rapper wants to sing; you can just express more.” Finding that singing afforded him more freedom to express ideas and emotion, he joined an acapella group called All 4 Love where he could expand upon his vocal growth. Influenced by what he calls “The Soul Starter Kit” of Stevie Wonder, Marvin Gaye, Curtis Mayfield, Bill Withers, Donny Hathaway and Bob Marley, he honed his voice and picked up the pen. 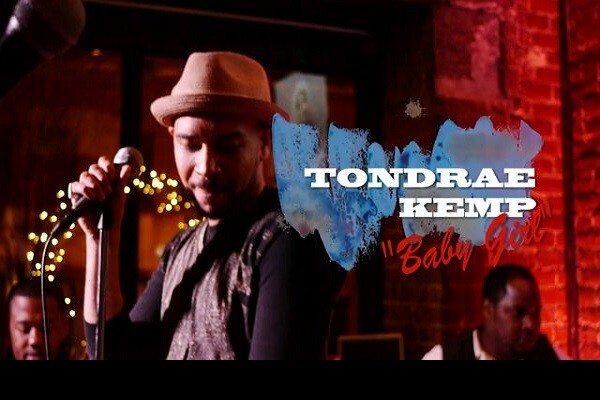 Tondrae worked to develop his repertoire of original songs while in film school at the University of New Orleans with friends and musical counterparts guitarist/ producer Dani Kartel and bassist/producer Roderick “Bassheavy” Tillman. He then began performing with a full band in clubs throughout New Orleans. It wasn’t long before Tondrae’s show was captivating large audiences at the 2002 & 2004 Essence Music Festivals and the 2003-05 & 2008 New Orleans Jazz and Heritage Festivals. Tondrae went on to share the stage with legends like Allen Toussaint, Leo Nocentelli (The Meters), Ivan Neville (Neville Bros.) and Irma Thomas. In 2005 he released his first full-length studio album Still Searching, with the infectiously funky “Don’t Trust Ya, But I Love Ya” and the Amen!-evoking title track, “Still Searching.” A live recording, Tondrae Live at Jazzfest, was released later that year on Munckmusic. Broadening his appeal by performing, writing and recording overseas in the UK and Holland, Tondrae has garnered an international audience and reputation for his versatility in styles and the energy of his live show. Having recorded in 2008 with London production duo Block 16 and Dutch Soul/Breakbeat producer D-Felic, as well as keyboardist/producer Michael Cain (Meshell Ndegeocello), he stayed busy with European and Stateside EP projects and collaborations. He also found time to infuse his film background by writing and starring in a semi-autobiographical screenplay and soundtrack about his move to NYC from New Orleans entitled Cool Landlord: Songs from the Room in 2009. Presently, Tondrae has teamed up with Kwality Records for the release of his new 10-track album Sun Money. You can find him playing venues, events, benefits and festivals between NYC and New Orleans in support of the release while continuing to record and collaborate. Through hard work and undeniable talent, Tondrae is fast becoming a well-respected, up-and-coming performer and recording artist. Tondrae has performed with and shared bills: Goapele, Kem, Ledisi, Steel Pulse, Kenny Lattimore, Chanté Moore, Carl Thomas, Common, The Roots, Charlie Hunter, The Dirty Dozen Brass Band, Toni Blackman, Daniel Bedingfield, Papa Mali, Eska, Jhelisa, Heidi Vogel, Don-E and Marlon Jordan.